St. Louis Bankruptcy and Divorce: Which Should You File First? •	A married couple can file a joint bankruptcy petition. If you wait until after you are divorced, each party will have to file their own case, which means paying additional attorneys’ fees. •	Most married couples share joint debts. 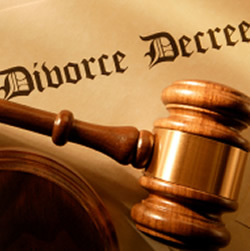 Discharging those debts prior to filing for divorce eliminates the need to address these debts during the divorce. This saves time and time is money when paying attorneys’ fees. •	Even though a divorce court can order one spouse to hold the other harmless on joint debt divided during the divorce, it cannot keep a creditor from coming after the other party for payment if the spouse ordered to pay the debt does not do so. •	Fighting with an ex-spouse regarding who is supposed to pay what debt can have a greater negative effect on your credit than just filing for bankruptcy. Just because your ex was ordered to pay the debt does not mean that the creditor stops reporting delinquencies on your credit report! If you file for bankruptcy and eliminate all of your debt prior to getting a St. Louis divorce, then you will have a true fresh start once the divorce is finalized. If you have questions regarding whether filing for bankruptcy prior to divorce is the right decision for you, contact a St. Louis bankruptcy attorney.